Looking back, it’s honestly quite incredible. The poultry-dubbed Kentucky whiskey brand that started under a New York wholesaler and sold to a French conglomerate, survived a period when KSBW distilleries were hanging on by a thread (some collapsing altogether). While I was just a lad when all this was happening, and even now lack actual perspective as to why Wild Turkey made it through this time, I’ll nevertheless give you my take on it. It’s pretty simple, actually. They stayed on course, kept producing whiskey, and focused on a single brand. And most importantly, they had the right man for the job, Jimmy Russell. I don’t know Jimmy personally. I have no gauge on his business acumen or marketing skills, but I do know one thing – Jimmy Russell knows how to make fine bourbon whiskey. There’s all sorts of shortcuts and gimmicks one can employ when facing hard times, but if you look at Wild Turkey products from 1979-1991 you find nothing of the sort. What you do find, however, is excellent bourbon whiskey. Bourbon that folks in 2017 now happily pay a significant premium to acquire. I’m sure there are folks at Pernod Ricard that deserve credit for weathering the glut era storm. But did those folks make the whiskey? No. And frankly, that’s what matters most to me. All I’m saying is thank goodness Jimmy was at the helm. I guess it will come as no surprise that today’s sample is from 1979 – a Wild Turkey 101 8-year from ‘79, to be exact. I’d like to offer a special thank you to a fellow Turkey enthusiast for the very generous sample. I’m genuinely excited to give this one a taste. Not only because it’s dusty Turkey, but because I’m curious to know how early glut era WT compares to releases later in that period. Overall: Hmm … not exactly what I expected. I mean, it is dusty Turkey – but – there’s something peculiar going on here. While there are indeed dusty WT notes present (herbal/floral, leather, tobacco, etc. 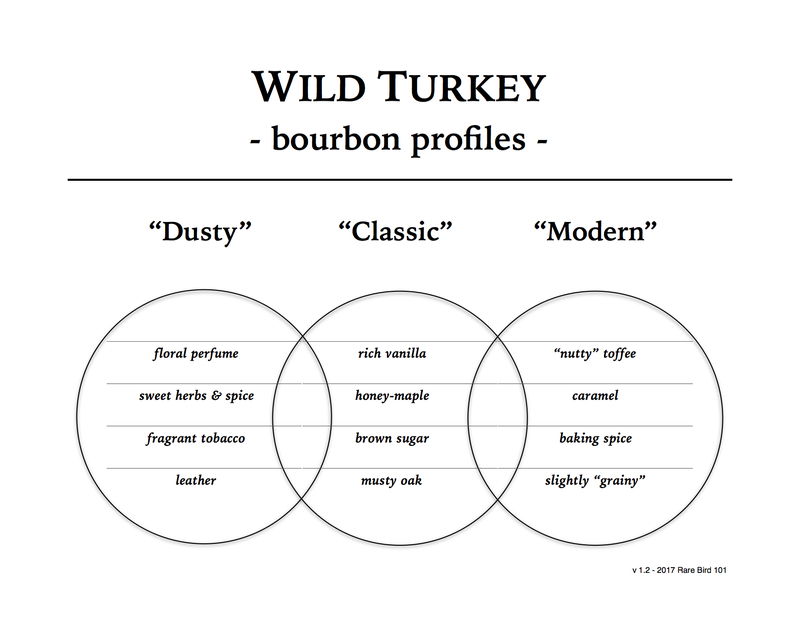 ), there’s more notably a preserved fruit and mineral vibe that I’ve rarely tasted in Wild Turkey bourbon (and never in dusty WT). After allotting some significant rest time, the mineral notes take a step back and the typical dusty notes move forward; however, even with additional air exposure, the overall mineral fruitiness stands out. Please don’t get me wrong. I’m not saying this particular Wild Turkey 101/8 is problematic or fails to provide enjoyment. I’m just saying that it’s not your typical dusty WT 101 profile. Why is that? I’m really not sure. Being a 1979 release we can’t rule out sourced whiskey (though it’s likely Boulevard distillate for the most). Or, maybe this particular batch was rather limited in rickhouse selection? In other words, it’s possible that this batch consisted of barrels from certain locations (warehouses, floors, etc.) known for more fruity profiles. Again, I’m honestly not sure. In closing, I’ll have to say that every dusty Wild Turkey bottle is a learning experience. You just don’t know what you’re going to end up with until you pop the cork. You’re sure it will be delicious – you just don’t know precisely how that level of delicious will play out. It’s very much like listening to the same jazz combo play the same song at different gigs. Each performance is somewhat similar, yet completely unique other ways. As for my preferences, I’ll take the ‘81 gig over the ‘79 (the ‘87 and ‘91 are a little more to my liking as well). That doesn’t mean 1979 Wild Turkey 101 doesn’t deserve an audience. It may not be my personal favorite, but it could very easily be someone else’s jam.